ORLANDO, Fla.--(BUSINESS WIRE)--NantHealth (NASDAQ: NH), a leader in connected care solutions, and Baxter International Inc. (NYSE:BAX), a global medical products company, today announced that a NantHealth digital health solution is now available to connect Baxter’s Prismaflex system to a hospital electronic medical record (EMR). 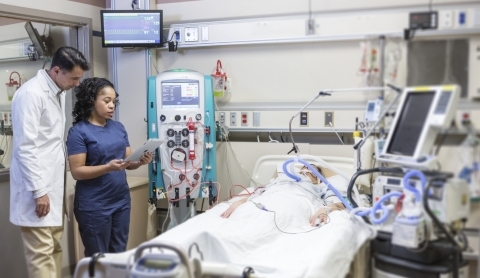 Prismaflex is used in the intensive care unit (ICU) to treat patients with acute kidney injury (AKI) and certain blood and autoimmune conditions, which can be life-threatening. The companies are demonstrating the technology at the 2019 Healthcare Information and Management Systems Society (HIMSS) Interoperability Showcase™ this week.